The complete extinction of sharks is imminent. For more than 400 million years they have dominated the oceans. But people exterminate them in just a few decades. And as history shows: what becomes extinct, stays extinct and never comes back. The fishing industry is mercilessly hunting the sharks and offers them as shark steak, shark filet or shark fin soup. But shark meat is rarely offered under its real name. Usually it is offered under different trivialized designations. The reason for that is simple: the customers should not know what they eat. The fishing industry is very imaginative and labels shark meat with completely new designations. 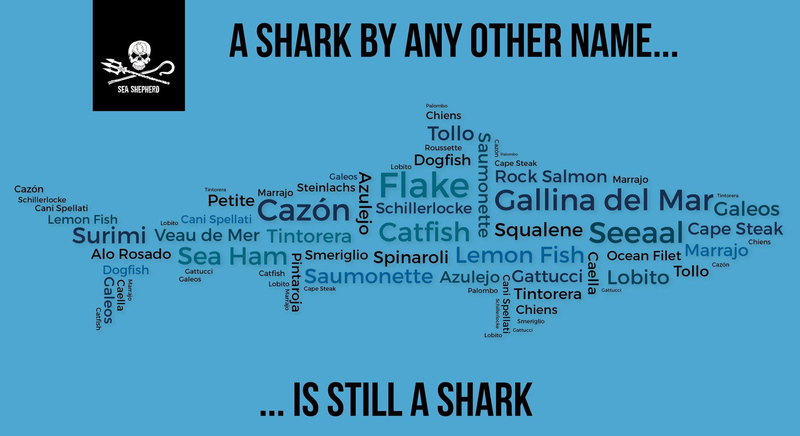 Therefore hands off from the following products in restaurants, snack stalls and supermarkets – because it is shark meat! Only by totally rejecting all shark products the worlds remaining shark population can be rescued. When fewer sharks are consumed, less sharks get hunted – because demand determines supply. Every purchase is a direct reorder from the fishmonger. As long as shark products are consumed the fishery will not stop hunting them. Thus, any consumer of shark products is directly complicit in the extinction of sharks. Renounce any kind of shark products!